Give something to your little flying friends as well as yourself with this gorgeous and decorative bird bath! The whole sculpture is antiqued bronze made with an aluminum bowl and cast iron pedestal and base. This luxurious bird bath is built to look as if it's been in the garden for generations but with the peace of mind that it will last for years to come. 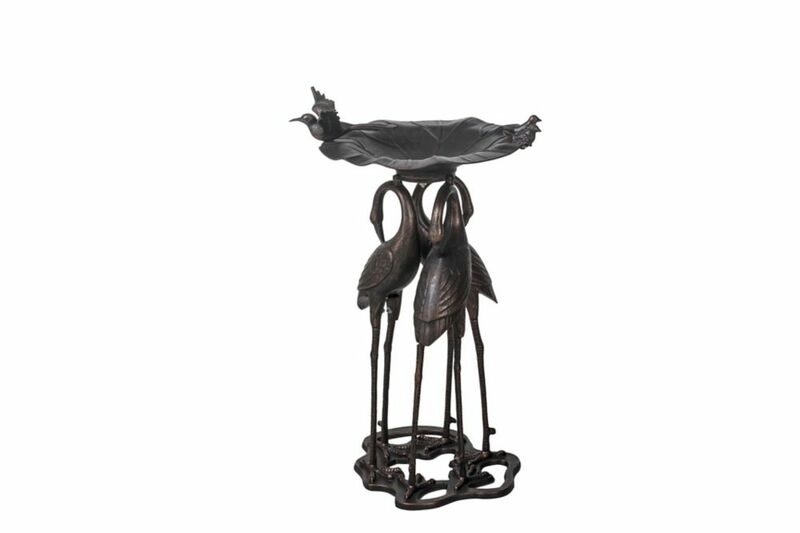 The bowl is stylized to look like a giant leaf, being supported by three graceful cranes as they primp and tidy their feathers, giving this sculpture a perfect, natural look that is sure to fit great in any garden or bring nature closer to your home on a porch or patio. Trenton Crane Set Give something to your little flying friends as well as yourself with this gorgeous and decorative bird bath! The whole sculpture is antiqued bronze made with an aluminum bowl and cast iron pedestal and base. This luxurious bird bath is built to look as if it's been in the garden for generations but with the peace of mind that it will last for years to come. The bowl is stylized to look like a giant leaf, being supported by three graceful cranes as they primp and tidy their feathers, giving this sculpture a perfect, natural look that is sure to fit great in any garden or bring nature closer to your home on a porch or patio. Trenton Crane Set is rated 3.3 out of 5 by 3. Rated 1 out of 5 by Mimi from This is a very heavy well-made item, but a nightmare to try and put together. You have to put ea... This is a very heavy well-made item, but a nightmare to try and put together. You have to put each leg on the cranes, get the top mounted to the heads and then to get the feet mounted onto the stand. We got ahold of a company who gave us some advise and emailed some better instructions but we never got the pieces to fit. we mailed it back to Home Depot. Very frustrating. Rated 4 out of 5 by Jim from Looks nice, but a little difficult to assemble with one person. Parts don't line up as nicely as ... Looks nice, but a little difficult to assemble with one person. Parts don't line up as nicely as you would think during assembly and tend to flop around when trying to get the bolts in place. Well made solid product. though. Have had it for just over a month and we really like how it has added to the look of the front of the house.